President Donald Trump “stands behind” Stephen Moore and Herman Cain, his picks for two open seats on the Federal Reserve Board, the top White House economic adviser said. Criticism of the pair for being insufficiently qualified or too partisan for the independent central bank is “unfair,” Larry Kudlow, head of the National Economic Council, said Sunday on CNN’s “State of the Union.” Moore and Cain, if confirmed, would represent Trump’s view that economic growth is not, by nature, inflationary, he said. Cain said in a video posted Friday on Facebook that he faces a “cumbersome” vetting process for a position at the Fed, suggesting the 73-year-old former pizza chain executive may be planning to bow out of consideration. Cain faced multiple accusations of sexual harassment during a bid for the 2012 Republican presidential nomination, allegations which he has denied. Comments by Moore saying he’d be on a “steep learning curve” as to how the Fed operates reflected “a little modesty” by the Heritage Foundation official, Kudlow said. Kudlow, in the first of two scheduled TV interviews for the day, didn’t directly call for a change in Fed interest rate policy, as he and Trump have done recently. Even so, he said he’s worried that U.S. monetary policy makers aren’t taking into account weakness in the global economy, or the absence of inflation. Some economic orthodoxy, including belief in the Phillips Curve -- which represents the relationship between the rate of inflation and the jobless rate -- is outdated, he suggested. 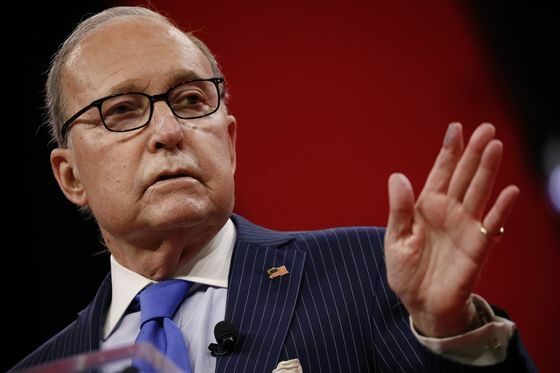 Kudlow said the U.S. would probably post first-quarter GDP growth of “2 percent-plus,” knocked down partly by the lengthy federal government shutdown. For the year, the U.S. could again log growth of 3 percent, he added. Trump on Friday called on the Fed to cut rates, saying that would turn the U.S. economy into a “rocket ship” -- a rate of growth characterized Sunday by Kudlow as 4 percent to 4.5 percent.